SAM WITWER is an actor whose work includes leading roles in the SyFy series Being Human, for which he was nominated for a Gemini Award, and the Star Wars Saga, where he brings various characters to life in video games, film, and television—including an Emmy-nominated performance as the voice of Darth Maul. He has also been featured on Once Upon a Time, Smallville, Battlestar Galactica, Stephen King’s The Mist, and Dexter. He has been an avid Dungeons & Dragons player since age 11. “I grew up during the early days of DUNGEONS & DRAGONS, and it’s been decades since I’ve seen the wonders that enthralled me during that magical time. At last, familiar treasures from the depths of the vault are here. They can make you cry depending on how deep you went. This is an incredible tome of power." “This is a time machine. Poring over these images forty years after I first held the Basic Set in my hands, I’m overwhelmed by the same ineffable feelings I had back in 1977. DUNGEONS & DRAGONS unlocked something in my twelve year old brain—an exhilarating sense of possibility—that set my future course as a game designer and writer. This book inspires me all over again"
"This tome of awesomeness [...] You can only begin to imagine the amounts of hours that this team of top notch authors poured into this. They gained unparalleled access to the archives of Wizards of the Coast and the personal collection of some of the top collectors. 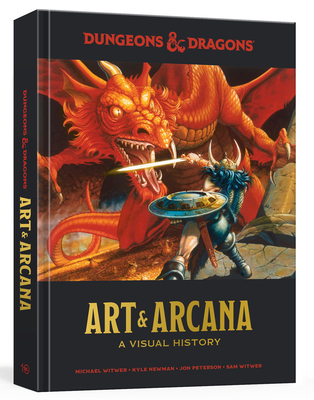 Needless to say this book will detail and illustrate the long and wonderful journey of Dungeons and Dragons from its humble beginnings to the cult status it obtained to this day. This has never been achieved in a book before making it the must-have D&D collectible." "Can’t give a higher recommendation than the highest for this amazing book! I’ve seen the preview and I was blown away page after Page! GET THIS BOOK!"